Yesterday afternoon I was in the throes of a dilemma –this was whether or not to go to the evening’s Borough Planning Commission meeting. As I understood it, the planners were either to approve, or disapprove of the MOTORIZED Jim Creek Parcel MASTER Plan. I at first talked myself out of going, saying that the Jim Creek Parcel is – over there, in the Butte, across the river. Although I’ve ridden there with my neighbor, Nancy Pfeiffer, a professional adventurer, it’s not my primary trail riding area. Then I talked myself into going, saying that we silent sport users are in this together. 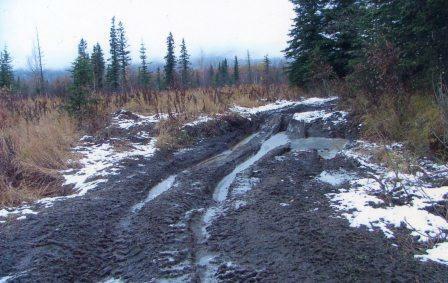 This appeared to be yet another instance in in which ATV users, under the guise of multi-use trails, are knowingly and unknowingly taking away what we value – near pristine trails. Then I talked myself into going. Then I talked myself out of going. My inner voice finally told me to stop being so ethnocentric, and further reminded me that all things are connected, a borough wide interest in preserving trails included. The meeting was a real eye opener. The majority who provided commentary during the audience participation portion of the meeting were huge men with beefy arms, tractor butts, and thick, hairy necks. These thugs were loud, coarse, and inarticulate. They, in a manner of speaking said “Me wanna ride. Been here all my life. My trails. My freedoms.” Conversely, the minority who provided commentary during the audience participation portion of the meeting were smaller women who dressed in a semi-casual fashion. These environmentalists were soft-spoken and articulate. They collectively argued that the concept of multi-use is a misnomer, and that ATVers will continue to do irreparable damage to the Jim Creek Parcel area. I was watchful. I took notes. I formulated an argument, based on my background and experiences as a silent sport enthusiast, and more specifically as an equestrian trail user. As I attempted to rewrite my notes, it occurred to me that we supposedly live in a democracy, in which it’s believed by many that there are two sides to every issue, and that both sides have legitimate concerns. This was an instance in which this is an erroneous belief. I tried then, in my write-up, to repeatedly refer back to this claim. I was one of the last audience participation members. I found the planning commission members to be somewhat interested in what I was saying – or so I thought. They, in fact, seemed more receptive than the majority of the borough assembly members, who during audience participation, routinely eat, flip disinterestedly through papers, and stare into space. I was respectful. I laid out my claims like a deck of cards, in the allotted three-minute time frame. Then I called it good. I figured that “we,” those of us who saw the plan as being one sided – that is pro-ATV use – stood a chance. I figured wrong. The planning commission members voted unanimously to approve the multi-use based plan. Their argument was that more were in favor of the plan than opposed. It was then that I realized that the planning commission members’ attention was based on the fact that we were the evening’s entertainment. They were not weighing the pros and cons of carefully constructed arguments. Rather, they were simply keeping a tally. I left the meeting site hurriedly, passing through a group of stinky men who were thumping one another on the back and applauding their own efforts. I didn’t say anything, because most outweighed me by at least 100 pounds. Instead, I began to grouse about unfair life is, and how this was yet another instance of how unfair life is. And, I continued with this line of thinking well into the wee hours of the morning. Today I’ve been thinking hard about how any of us might construct better arguments, which are arguments that enable us to win. I realized that one approach might have been to take on the persona of an ATV user. If, say, I had led the fray, and gotten others to do the same, we might have swayed the planning commission members. The plan now goes before the Borough Assembly members. I am going to lend support to getting them to say no to this plan. And in light of this, the first thing I’m going to do is sell one of my horses and purchase an ATV. . . .